Hanukkah, the Jewish Festival of Lights, is just around the corner! Traditional Hanukkah fare includes foods that are deep fried, in honor of the miracle of the oil that lasted eight days in the Holy Temple. Deep fried holiday deliciousness… who wouldn’t get behind that food tradition?? 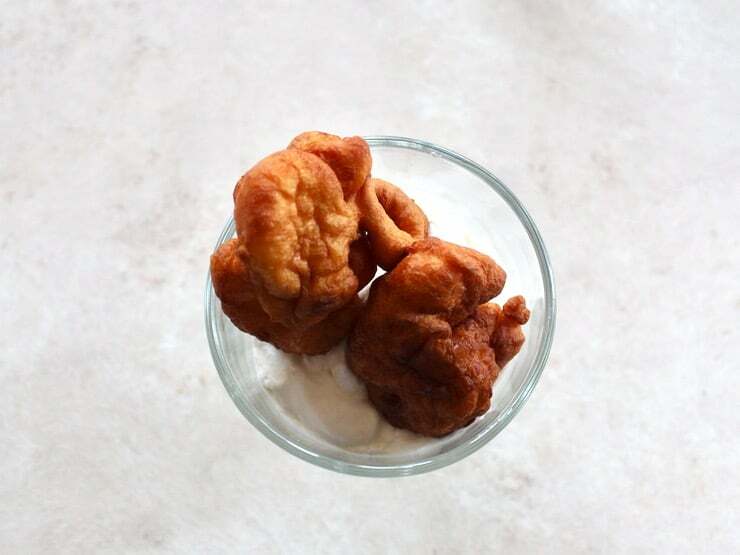 In our family we celebrate by making “levivot “– fritters that are fried to crispy, fluffy goodness. 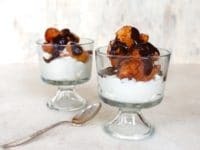 When Clover Sonoma asked me to share a family recipe for their #CheerstoTraditions campaign, I started imagining those fritters in a sundae, layered with different sweet flavors and textures. It’s a fairly simple dessert with out of this world flavor! 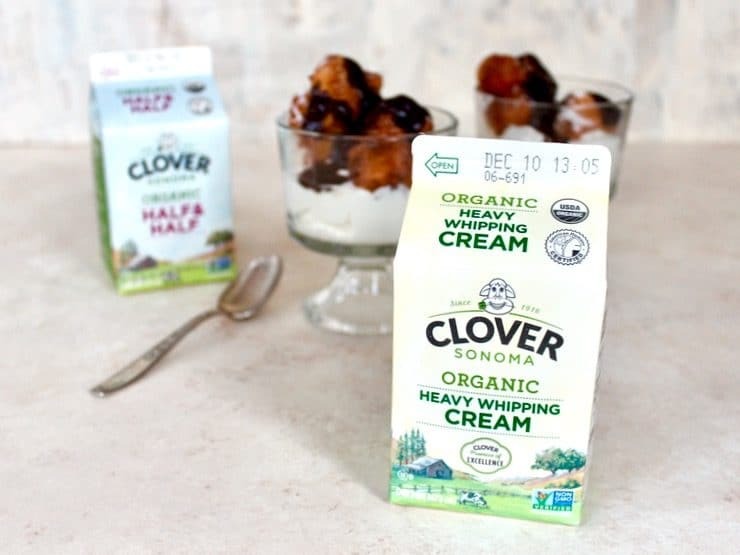 I’ve the pleasure of partnering with Clover for Hanukkah in the past and have been a fan of their organic dairy products for a while now. Since they first appeared in the early 1900s, Clover has remained conscious and careful about what goes into their products. They are committed to natural dairy products, including non-GMO and organic options, sourced from small, local farms. These values are also important to me, particularly when it comes to what I feed my family, and I love having a go-to dairy brand that covers all the bases. 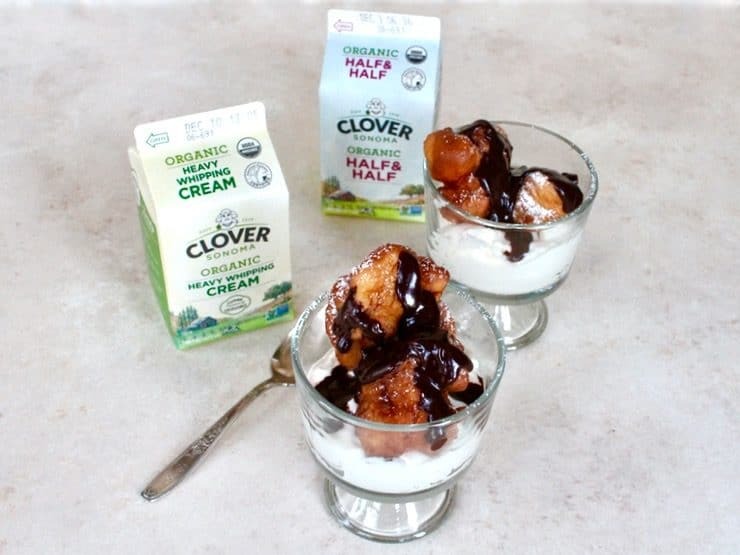 Since Clover is a dairy brand, I knew this recipe had to have some kind of uniquely indulgent addition made from Clover organic products. Typically, we serve our levivot with a sweet syrup or chocolate syrup. Here I’ve added lightly sweetened fresh whipped cream to the mix. The recipe includes Clover’s Organic Heavy Cream, Organic Unsalted Butter and Organic Half and Half. It is decadent and delicious, a holiday splurge that is absolutely worth having! Make sure that your fritters fry for at least 3 minutes– if they brown too fast, they won’t cook all the way through. 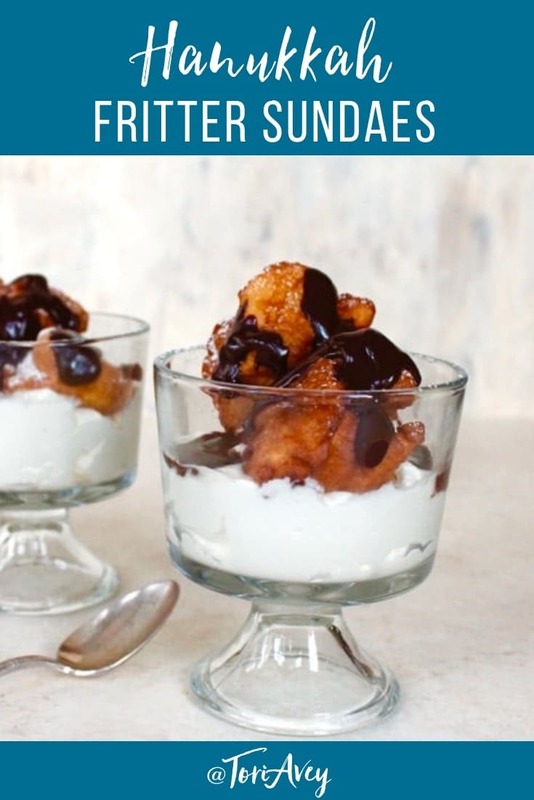 Fry them just before you’re ready to serve your sundaes, otherwise you’ll risk losing their lovely crisp exterior. The fritters themselves aren’t sweetened, but the whipped cream, chocolate sauce and sprinkle of powdered sugar will take care of that! When you make this recipe at home (or any holiday recipe using Clover products), be sure to share it on social media with the hashtag #CheerstoTraditions. Each time this hashtag is used, Clover will donate one product to a local food bank. Follow Clover on Facebook, Twitter, YouTube, Pinterest, and Instagram. Click here to find out if Clover Organic Dairy Products are available in your area. 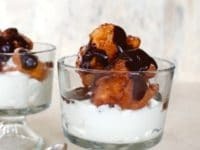 Simple Hanukkah holiday sundaes made with fresh whipped cream, luscious chocolate sauce, and crisp warm fritters. Pour chilled heavy whipping cream into a mixing bowl along with 3 tbsp sugar. Use your hand mixer or stand mixer to whip the cream for 3-5 minutes on high speed just until the cream reaches stiff peaks. Reserve in refrigerator until ready to serve. You can make the whipped cream up to 2 days ahead and store covered in the refrigerator to speed the prep process for this recipe. 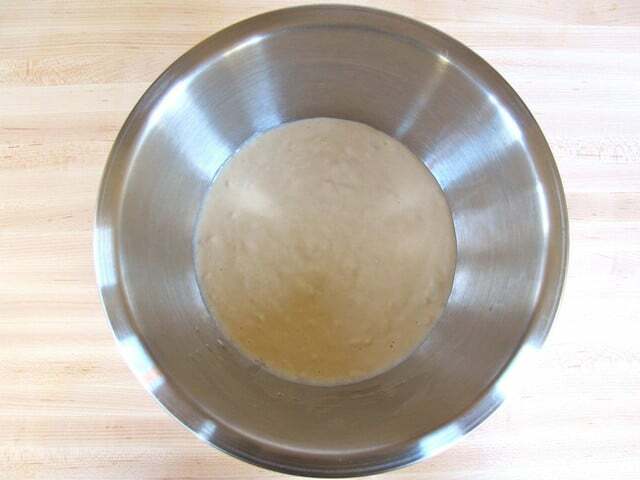 In a mixing bowl, use a fork to mix together the flour, baking powder, and salt. In a separate bowl, beat the egg, ½ tsp of vanilla, and ¾ cup half & half together until well combined. Add the egg and milk mixture to the flour mixture and stir with a fork until a thick batter forms. Warm oil (use the whole 32 ounce bottle) over medium heat until hot enough for frying (around 365 degrees F). Use a metal soup spoon to scoop up each portion of batter. Drop batter by heaping tablespoonfuls into the hot oil. 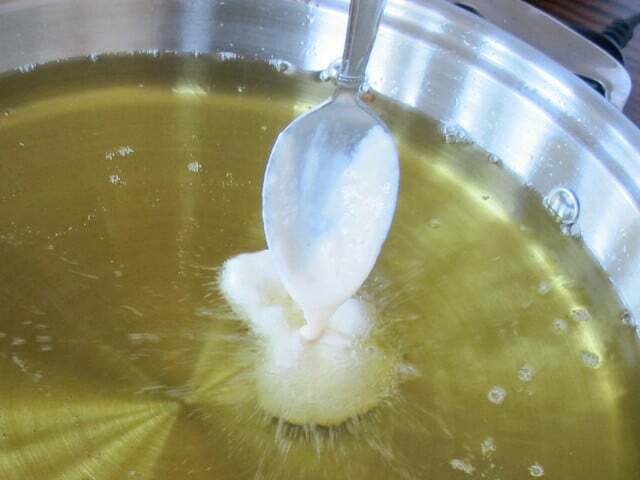 The oil should sizzle but not splatter-- if the oil pops or splatters, let it cool slightly before proceeding. Test one fritter first to see if you've got the oil temperature right. You want the oil temperature at the low end of the frying spectrum-- they take a while to cook through. Make 4-5 fritters at a time. Keep a metal slotted spoon handy to turn the fritters as they become golden. 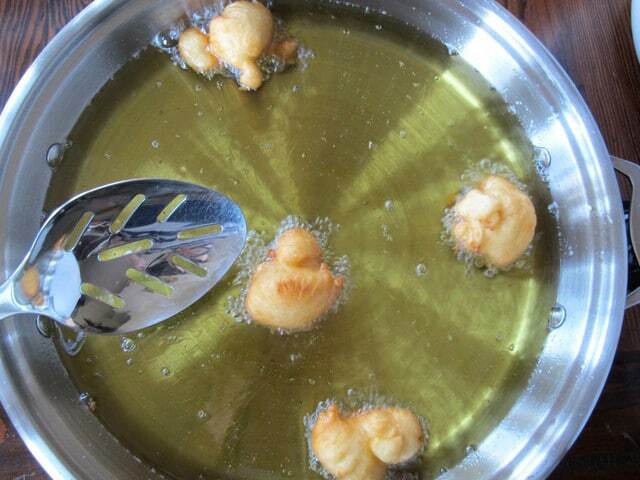 Fry the fritters until golden brown on both sides. If the oil is at the right temperature, it should take about 3 minutes for the fritters to brown completely and cook all the way through. Drain fried fritters on a wire rack. You should get around 12-14 fritters. 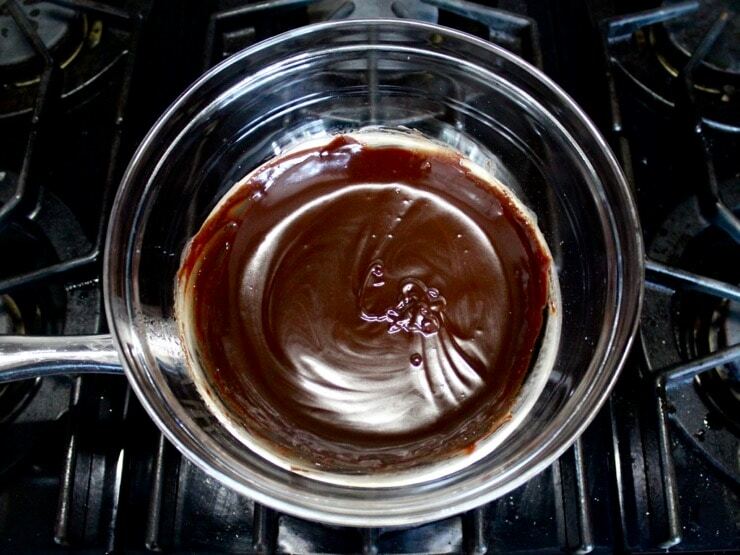 Melt semisweet chocolate in a double boiler over medium heat. 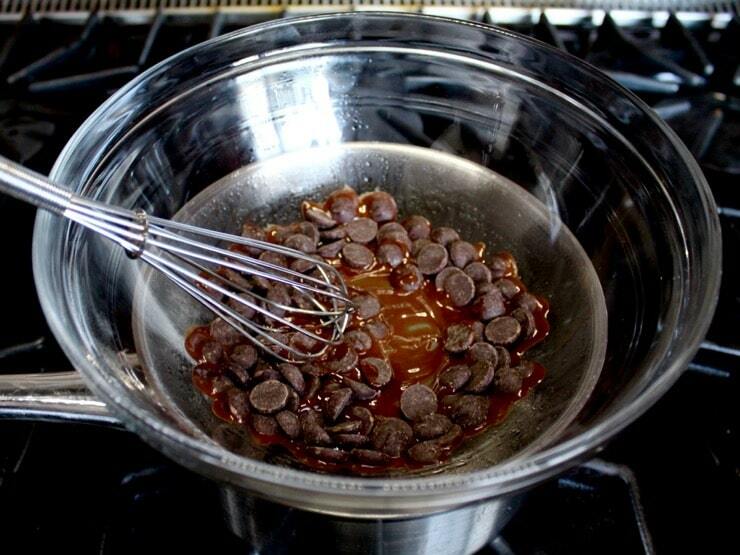 Whisk in 3 tbsp sugar and butter, stirring constantly, until the butter is completely melted and mixed into the chocolate. Whisk in ¼ cup half & half, a tablespoonful at a time, stirring to combine after each addition. 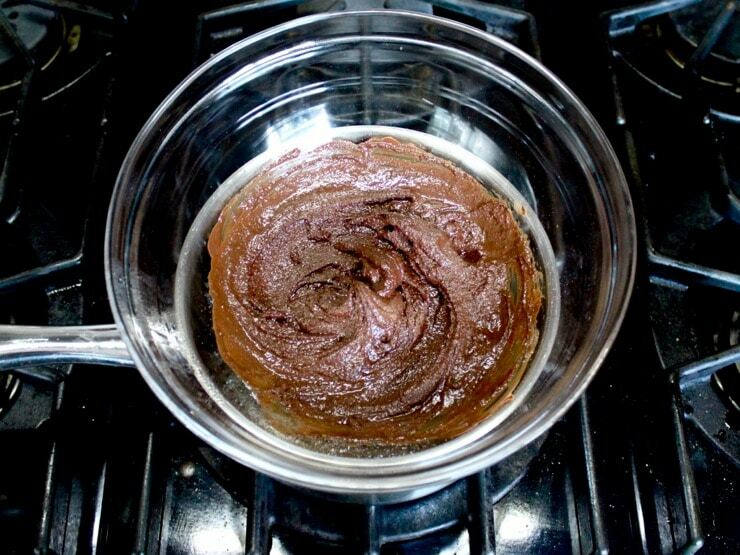 Whisk the sauce over medium heat until the half and half is fully incorporated. Add more half & half as needed to reach a rich, pourable consistency like hot fudge. 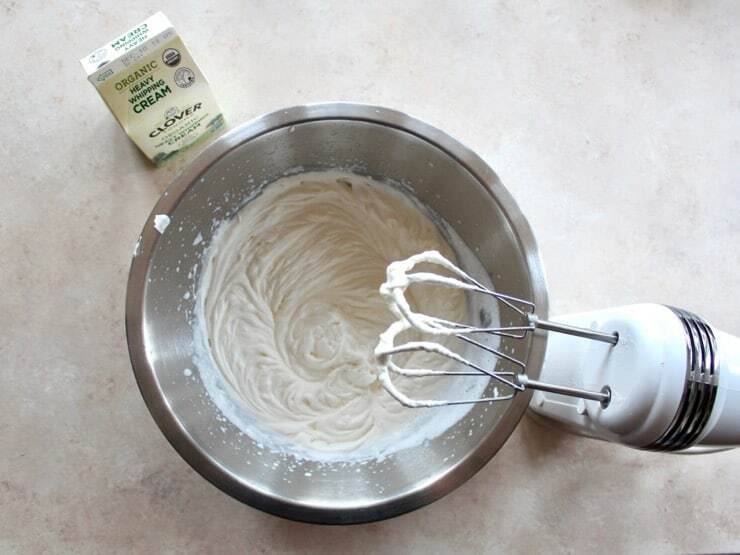 Whisk in 1/2 tsp vanilla. 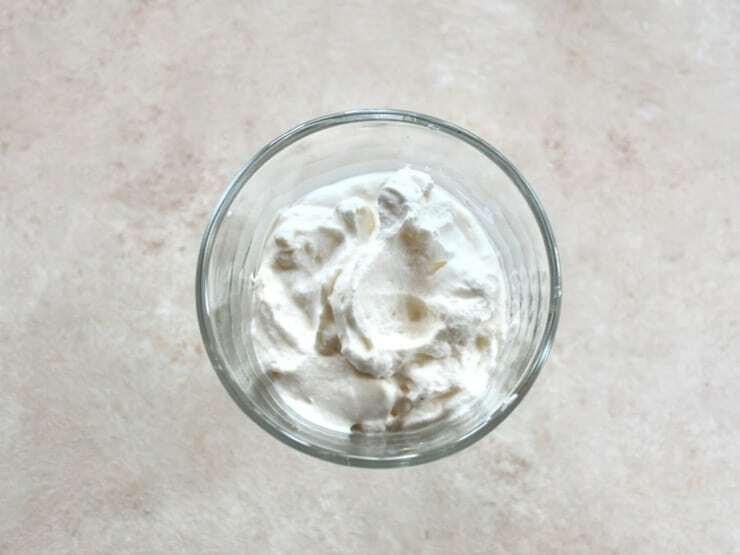 Place a large dollop (a heaping 1/4 cup) of whipped cream into the bottom of your dessert dishes. 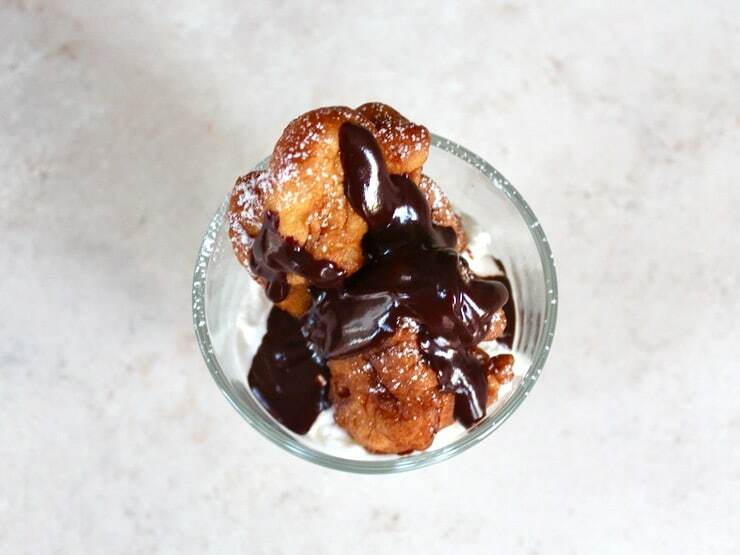 For each sundae, place 2 warm fritters on top of the whipped cream. 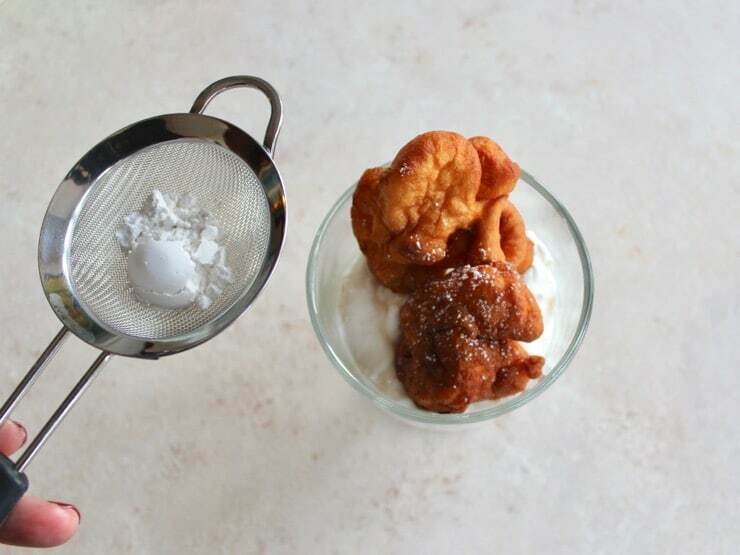 Sprinkle the fritters with a little powdered sugar using a fine mesh strainer for even distribution. Drizzle on about 1 tbsp of chocolate sauce, or more to taste. This post is in partnership with Clover Sonoma. Thank you for supporting my sponsors, they allow me to share more free recipes, cooking tutorials, holiday crafts and food history with you! This was truly delicious! Thank you for an easy, awesome dessert recipe.